On the first weekend of November I was invited by the team at Shield Airsoft to attend their Krytac LMG Release/Open Range Day to test the new Krytac LMG and experience some real steel shooting. The event took place over the 7th and 8th of November at the Tunnel Target Sports Centre in Charmouth, Dorset. The price for the day was £32 including all activities if pre-booked or £36 on the day. During the weekend there was chance to take part in a range of activities such as the 6 Stage Competition for Airsoft Pistol and Rifle on the 40m range, a 3 Stage Introduction to 22 real steel on the 25m range, LMG blast in the 100m range, a chance to play against the newly formed Shield Airsoft team in the Tunnels and a blast on the scenario simulator. There was also an FAC workshop and question time with firearms officer, Bob Parkhouse. The Open Range day was held at The Tunnel Target Sports Centre in Charmouth, Dorset which is the home to a 25m, 40m and 100 metre indoor ranges - it has one of the only indoor full bore ranges in the UK rated up to .50 Calibre. They don’t just cater to seasoned shooters though, their ranges are open to beginners as well, as full supervision is provided by NRSA and NRA qualified Range Officers. The ranges are open to both members and non-members, with The Tunnel offering a fully supervised one hour shooting experience for non-members and beginners for the reasonable price of £24.50 which includes range hire, rifle hire, 50 rounds of 22LR and full supervision. The Tunnel also offers a Laser Judgemental Training Suite which enables realistic scenario training in G36 and Glock 19 for security training. The site was granted Section 7(3) status in 2014. Which means legislation allows the holders of Firearms Certificates to store and shoot pistols of historic interest at S7(3) sites. As The Tunnel is so far from my home in the Midlands I decided to stay overnight in the Tunnel Pods. The Tunnel Pods are hand crafted, insulted camping pods that either sleep 2 (standard pod) or up to 4 (family pods). The family pods have their own toilets and washbasins whilst the standards have access to the toilet and shower block. They all have their own decked seating areas and access to the sheltered BBQ/snug area. The pods are really cosy and provide all the amenities you could need (although bring your own bedding – that’s the only thing that caught me out!) My pod cost me £35 for one night, now I personally think this is a little pricey for what you get but it is still cheaper than any hotel in the surrounding area. So now you know about the venue, who are Shield? Shield are a firearms and sights company that was established in 1982 by Jeremy White. They specialize in military proven red dot sights and are the UK distributors of Krytac (the new Airsoft venture of the Switzerland based firearms manufacturer, KRISS group). 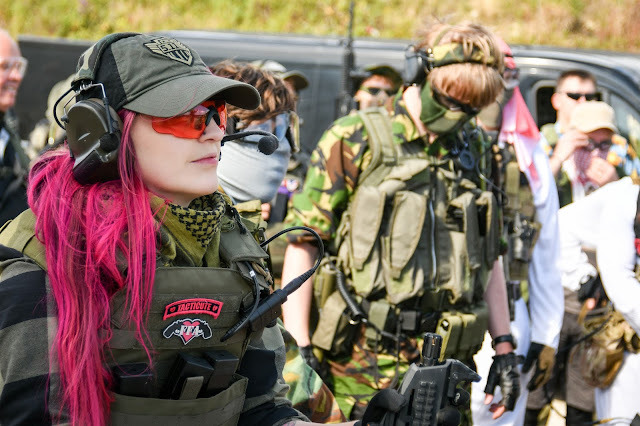 They sponsor a team of 6 players who wanted to take Airsoft to the next level by using real firearms techniques and tactics to reflect Shields end goals within the Airsoft industry. Shield are family run business and it was a pleasure to meet them during the event, they were friendly, welcoming and easy to have a laugh with. Let’s get down to the event itself, I started my weekend by putting some rounds through the Trident LMG herself. My first impressions of the LMG are very good. Despite being a support weapon, she is very light without compromising on the quality of the internals, is aesthetically pleasing, accurate with a great ROF and the semi auto function is a nice addition meaning she can be used on semi only sites. You can either run the box mag provided or M4 mags which during ops would be extremely useful. During the ‘Attack Team Shield’ game we played in the tunnel, we came up against the LMG and it proved to be a worthy adversary. Combined with the Shield CQS sight it’s accuracy against us was quite something! We had a blast in the tunnel attacking and defending the flag against team Shield! The Tunnel was full of gunfire, smokes and bangs going off making the experience epic! Although my favourite ‘Airsoft’ part of the weekend however was running the 6 stage rifle competition in the 40m range. The competition stages were lovingly built and put together by the Shield team especially for the weekend and they did a fantastic job. The stages were a variety of scenarios that were to be completed in the quickest time possible and ranged from room to room breach and clear, car scenarios, stair clearance and other stages to battle it out for a chance to win a Shield CQS sight! Now although I didn’t win the sight, it was awesome to put the Krytac PDW, SPR and CRB through their paces on the course! Over the weekend I also got chance to have an introduction to real steel shooting – by giving the 3 stage introduction to 22 shooting on the 25m range a blast. We were given a safety brief by the instructors on the range as real steel is obviously a lot different to shooting an Airsoft gun. I absolutely loved every second of it – the sound and feel of the recoil of the rifle really got my adrenaline pumping and left me wanting more. I was lucky enough to get some pointers and tips on how to improve everything from my accuracy to range times, which has really encouraged me to try take up 22 practical shooting! I had an amazing weekend at the Open Range Day and LMG release, the activities on offer were fun, engaging and exciting to take part in. The cost for the day was excellent value for money due to the unique nature of the activities – 22 rifle shooting isn’t something you get to experience every day! The event was even better value if you pre-booked! Although it was a fair way away from home, the experience was definitely worth it and I’m really looking forward to the next Shield event! Count me in! Hardwick, K. (2016). Krytac LMG Release. Airsoft Action. 57 (January), 46-47.